Constant d'Aubigné was a French nobleman, son of Théodore-Agrippa d'Aubigné, the poet, soldier, propagandist and chronicler. Louise Arthemise d'Aubigné was a daughter of Agrippa d'Aubigné and Suzanne de Lusignan de Lezay. Paul Scarron was a French poet, dramatist, and novelist, born in Paris. His precise birthdate is unknown, but he was baptized on 4 July 1610. Scarron was the first husband of Françoise d'Aubigné, who later became Madame de Maintenon and secretly married King Louis XIV of France. Marie de Hautefort, was a French noble and lady-in-waiting, a trusted confidante and adviser of King Louis XIII of France. They did not have a sexual relationship and she was thereby a favorite rather than a royal mistress. She was also a personal friend of Queen Anne of Austria. On the death of her husband in 1715, Françoise retired to Saint-Cyr. The Duc d'Orléans, as Regent of France, honoured her with a pension of 48,000 livres. She continued to receive visitors at Saint-Cyr. Françoise died on 15 April 1719 and was buried in the choir at Saint-Cyr, bequeathing her Château de Maintenon to her niece, Françoise Charlotte d'Aubigné, the wife of Adrien-Maurice, 3rd duc de Noailles  and her brother Charles' only daughter. In her honor, a small island, off the coast of Cape Breton, Nova Scotia, Canada, which at that time was known as "L'Île Royale", was attributed to her; this island was named Isle Madame (first noted as l'Isle de la Marquise). 1 2 Fraser 2006, p. 149. 1 2 3 4 5 6 7 8 Bryant 2004, p. 79. ↑ Fraser 2006, p. 150. 1 2 3 4 5 6 7 8 9 10 11 12 13 14 15 16 17 18 19 20 21 Stephens 1911. ↑ Fraser 2006, p. 151. 1 2 Fraser 2006, p. 152. 1 2 3 4 5 6 7 8 Bryant 2004, p. 80. ↑ Fraser 2006, p. 158. ↑ Herman 2004, p. 115. ↑ Buckley 2008, p. 276. ↑ de Rouvroy, vol. 10, ch. 75. ↑ de Rochechouart de Mortemart 1899, bk. 7, ch. 47. 1 2 3 Bryant 2004, p. 83. ↑ Fraser 2006, p. 251. ↑ Gay Levy, Darline (1981). Women in Revolutionary Paris: 1789-1795. University of Illinois: University of Illinois Press. pp. 5–7. ↑ Fitzgerald, F. Scott (1925). The Great Gatsby . New York: Scribner. p. 99. ISBN 978-0-7432-7356-5. ↑ Fraser 2006, p. 280. Françoise-Athénaïs de Rochechouart de Mortemart, Marquise of Montespan, better known as Madame de Montespan, was the most celebrated maîtresse-en-titre of King Louis XIV of France, by whom she had seven children. Louise de La Vallière was a mistress of Louis XIV of France from 1661 to 1667. She later became the Duchess of La Vallière and Duchess of Vaujours in her own right. She has no known surviving descendants. Louise was also very religious and she led a religious penance for herself near the end of her life. Marie Adélaïde of Savoy, Princess of Savoy was the wife of Louis, Dauphin of France, Duke of Burgundy. She was the eldest daughter of Duke Victor Amadeus II of Savoy and of Anne Marie d'Orléans. Her betrothal to the Duke of Burgundy in June 1696 was part of the Treaty of Turin, signed on 29 August 1696. She was the mother of the future King Louis XV of France. Styled as Duchess of Burgundy after her marriage, she became Dauphine of France upon the death of her father-in-law, Le Grand Dauphin, in 1711. She died of measles in 1712, followed by her husband a week later. Marie Angélique de Scorailles was a French noblewoman and one of the many mistresses of Louis XIV. A lady-in-waiting to his sister-in-law Elizabeth Charlotte, Princess Palatine, the Duchess of Orléans, she caught the attention of the Sun King and became his lover in 1679. She died two years later, most probably as a result of complications arising from childbirth. Maintenon is a commune in the metropolitan area of Paris, France. It is located 63.5 km (39.5 mi) southwest of the center of Paris. Louis-Auguste de Bourbon, duc du Maine was an illegitimate son of the French king Louis XIV and his official mistress, Madame de Montespan. The king's favourite son, he was the founder of the semi-royal House of Bourbon-Maine named after his title and his surname. Le Roi Soleil is a French musical about the life of Louis XIV. It premiered on 22 September 2005 at the Palais des Sports in Paris. The King's Way is a novel by the French author Françoise Chandernagor first published in 1981. It is the story of Françoise d'Aubigné, marquise de Maintenon, who in the 17th century was almost the queen of France. It follows her destiny, from her birth in a prison in Niort and her poor childhood, to a marriage to a disabled poet, and her life in the court of Louis XIV, king of France, where she became his companion and finally his wife. Charles d'Aubigné, Count of Aubigné (1634–1703) was the brother of Françoise d'Aubigné, Marquise de Maintenon, the second wife of King Louis XIV of France. The king showered gifts and titles upon his new wife's brother upon their marriage; in a letters patent Louis conferred upon him the titles of Comte d'Aubigné et Pair de France, Marquis de Maintenon, Duc de Saint-Cloud, Baron de Surimeau, Maréchal de France et Chevalier du Saint-Esprit, along with the style of Son Altesse Serenissime, a dignity normally reserved only for the Princes of the Blood. While he did not receive his sister's title until her death the combination of Serenity, being a member of the most prestigious chivalric order in France at that time, the Order of the Holy Spirit, as well as having his father's title restored to him as well as made a peer, which was not automatic in France for nobles as in England, put him in a most wonderful position at court. Veronica Buckley is a writer and biographer. She was born in Christchurch, New Zealand. In 1979 she graduated from the University of Canterbury with first class honours in French with philosophy, and was awarded a postgraduate scholarship in cultural and social history at the University of London. Before embarking on her writing career she worked as a musician, and as a technical writer and information management specialist in the IT industry. Louis César de Bourbon, Légitimé de France, Count of Vexin was a son of Louis XIV of France and his mistress Madame de Montespan. He was the Abbot of Saint-Denis and of Saint-Germain-des-Prés. Louise Mary-Antoinette Josèphe Jane de Bourbon-Maisonblanche, Baroness of La Queue, was an illegitimate daughter of Louis XIV of France and Claude de Vin des Œillets, the called Mademoiselle des Œillets, who was the lady-in-waiting to Madame de Montespan, Louis' long term mistress. 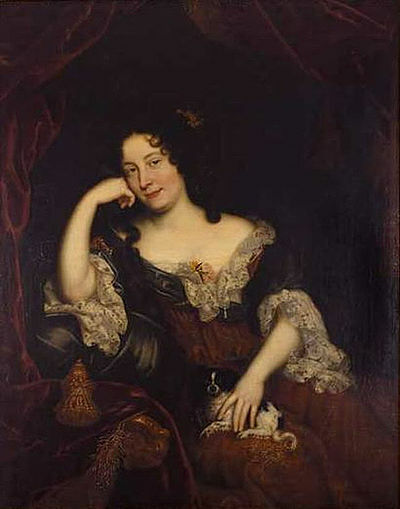 Louise Françoise de Bourbon was a grand daughter of Louis XIV of France and his mistress Françoise Athénaïs de Rochechouart de Mortemart, better known as Madame de Montespan. Louise-Françoise was known as Mademoiselle du Maine and had no children. Françoise Charlotte Amable d'Aubigné, Duchess of Noailles was the wife of Adrien Maurice de Noailles, 3rd Duke of Noailles. She was the niece of Françoise d'Aubigné, Madame de Maintenon, and her heiress. Stephens, Henry Morse (1911). "Maintenon, Françoise d'Aubigné, Marquise de" . In Chisholm, Hugh. Encyclopædia Britannica . 17 (11th ed.). Cambridge University Press. pp. 442–444. Wikimedia Commons has media related to Madame de Maintenon . Wikisource has the text of a 1921 Collier's Encyclopedia article about Françoise d'Aubigné, Marquise de Maintenon .